Siopaella Designer Exchange - Blog Siopaella Designer Exchange - Blog – tagged "prada"
Here at Siopaella we love Prada and it's sister brand Miu Miu! Although both brands essentially come from the same place they are completely different! Especially in terms of styles and designs...Here is a few points why we love both Prada and Miu Miu so much! 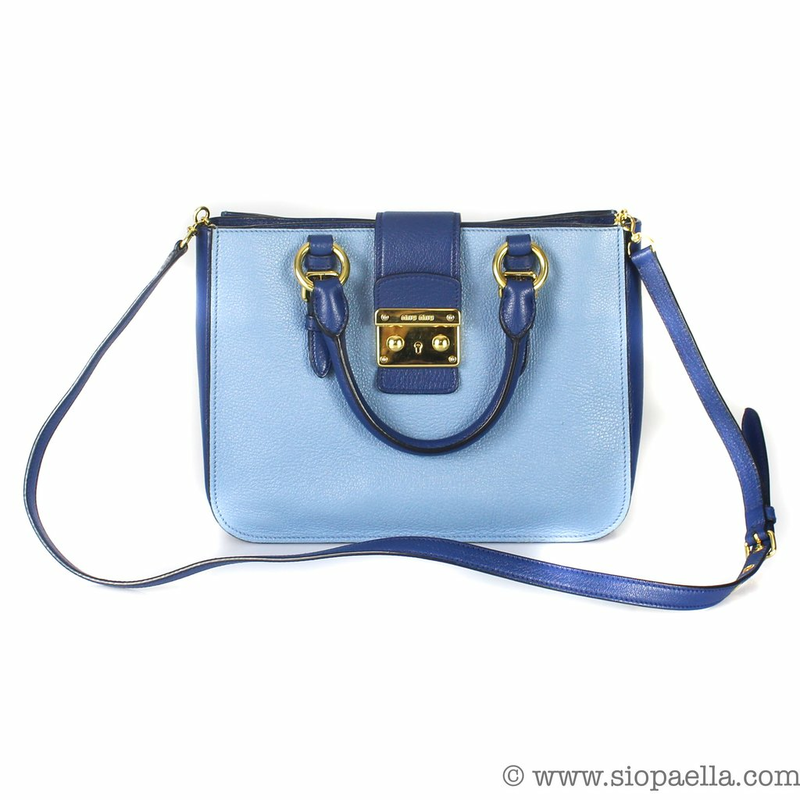 Something that Prada is most well known for is its iconic Saffiano leather. It was created by Mario Prada and is essentially a textured leather that makes it extremely resistant to scratches. After Saffiano leather was perfected in 1913 they began the production of their very first handbag, 'The Saffiano'. Which is now one of the most iconic bags in fashion history. The Devil certainly didn't wear Prada for nothing. The iconic Italian fashion house, now under the helm of Miuccia Prada, is a huge hit among our customers. Featuring careful leather craftsmanship and the iconic logo, a Prada bag is one that will be loved and treasured. Lucky for all you designer lovers, we currently have some gorgeous Prada goodies on sale for a fraction of the retail price. From wallets to shoes, there's something for everyone. Shop the rest of our Prada collection here. There is no better feeling than getting a gift in it's original box. First of all you get to unwrap the beautiful paper to unveil the iconic box giving you a hint of what lies inside. Then you get the big reveal through unboxing - and you all know how much we love a good unboxing! Also, from someone who's all thumbs, how much easier is it to wrap a neat square box rather than a lumpy bag or wallet?! And to make this holiday season even easier we've rounded up our favourite gift ideas that all come with their original boxes! So sit back, grab some hot chocolate and click, click, shop! So supposedly you're not meant to buy a wallet for yourself. Somebody should always buy you your wallet! Now if that isn't an excuse to get a gorge new wallet like this Prada one for Christmas then we don't know what is?! This beauty is €249. You cannot go wrong with this bag of the decade from brand of the decade, Gucci! Although we warn you, there will be squeals from the lucky lady who opens this so maybe take a step back,,, and warn the neighbours. This one is €699. Now this bag is a piece of luxury. It is currently sold out in Louis Vuitton in Ireland and the UK so will make the BEST surprise to anyone who is a Louis Lady. This one is €2,399. ﻿﻿Iconic, timeless and a real classic.. no not me in 40 years, this Chanel single strand of pearls. For anyone who loves their elegance then this is the gift for them. This classic costs €1,499. Still unsure of what to get the person you love? Then the Siopaella Gift Card is what you need. A piece of luxury that they can choose. More info here. Anyone who is a luxury bag lover would recognize Prada for her elegant and quality leather designs. I love how her bags can make any outfit look classy and effortless. We have been lucky enough to have received a fabulous selection of Prada Saffiano totes this month in various colors shapes and sizes. With spring just around the corner, these bags could be the perfect addition to brighten up your outfit. For anyone who is not familiar with Saffiano leather, it is a unique and durable style of leather. It is mainly made from calf skin. The way the leather is treated gives it a textured cross hatch pattern. The leather is then finished with a wax coat. The leather is actually coated in the color instead of dyed. Saffiano is extremely durable, and an added perk especially for us Irish girls ; water resistant. With the right care, the Prada Saffiano bags will last you years. For anyone interested in these classic Prada totes, pop over to our website to have a better look. If anyone has Prada bags they are looking to sell, don't worry we will gladly take them off your hands. Be sure to check our website on how to consign with us also!